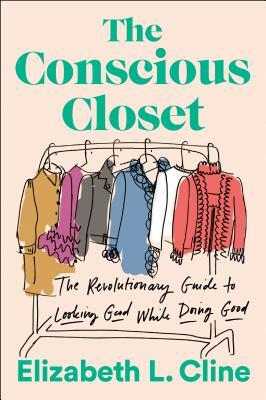 From journalist, fashionista, and clothing resale expert Elizabeth L. Cline, “the Michael Pollan of fashion,”* comes the definitive guide to building an ethical, sustainable wardrobe you'll love. Clothing is one of the most personal expressions of who we are. In her landmark investigation Overdressed: The Shockingly High Cost of Cheap Fashion, Elizabeth L. Cline first revealed fast fashion’s hidden toll on the environment, garment workers, and even our own satisfaction with our clothes. The Conscious Closet shows exactly what we can do about it. Whether your goal is to build an effortless capsule wardrobe, keep up with trends without harming the environment, buy better quality, seek out ethical brands, or all of the above, The Conscious Closet is packed with the vital tools you need. Elizabeth delves into fresh research on fashion’s impacts and shows how we can leverage our everyday fashion choices to change the world through style. Inspired by her own revelatory journey getting off the fast-fashion treadmill, Elizabeth shares exactly how to build a more ethical wardrobe, starting with a mindful closet clean-out and donating, swapping, and selling the clothes you don't love to make way for the closet of your dreams. The Conscious Closet is not just a style guide. It is a call to action to transform one of the most polluting industries on earth—fashion—into a force for good. Readers will learn where our clothes are made and how they’re made, before connecting to a global and impassioned community of stylish fashion revolutionaries. In The Conscious Closet, Elizabeth shows us how we can start to truly love and understand our clothes again—without sacrificing the environment, our morals, or our style in the process. Elizabeth L. Cline is a journalist, public speaker, and the author of Overdressed. Her writing has appeared in The Los Angeles Times, The Atlantic, The Nation, and The New Yorker, among others. She is an expert on fashion industry waste, runs a clothing resale business, and is the director of research and reuse at Wearable Collections, one of New York City's largest used-clothing collectors. She lives in Brooklyn with her partner, Joseph D. Rowland, of the band Pallbearer, and their cat Lily.